Reach Lode begins at the village of Upware on the River Cam. In Roman times it formed part of a massive bank and ditch, named Devil's Dyke, which was built for defensive purposes. 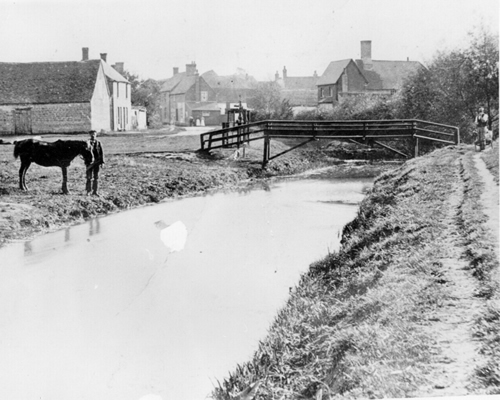 The dyke, built c300ad, used to run for 3 miles from the River Cam to the village of Reach and then straight on across what is now the village Green. There is evidence of Roman Quays at Upware and Reach was a port with clunch being the main export. (Clunch is a type of chalky building material). In medieval times there were villages on either side of the dyke, East Reach and West Reach, but by the early 1100's a fair had been established and parts of the dyke had been flattened. This created a large piece of land where commerce grew and the dyke became an important link to the outside world. Such was the success of Reach fair that it became one of the most important in Eastern England.Coastal vessels brought goods along the dyke to several wharves, basins and a hithe. Evidence of these areas still exists. The construction of Denver Sluice, near King's Lynn, in the 1600's prevented coasters from sailing to Reach though other boats still made the journey up until the late 1700's. In the early 1800's there was a plan to create a canal to connect London to Cambridge and King's Lynn. One survey (made by John Rennie) drew a line which proposed the use of Reach Lode as a connection from the River Cam to the proposed Canal. However, the canal was never built. In 1821 a lock was built on the lode as part of the Eau Brink Act aimed at making the River Great Ouse more navigable. A few years later the lode was taken over by the South Level Commissioners who were made responsible for its upkeep. During the 1900's, Reach Lode continued to be used to carry goods though Reach itself became less of a port while Burwell (on a "tributary" lode) became much busier due to the opening of a fertiliser factory. The last load of clunch left Reach during the 1930's, carried to Peterborough by Vic Jackson's gang of Lighters. A typical journey from Peterborough would take 3 days to see a load reach Reach Lode!! Small amounts of other cargo continued to be carried after this time but WW2 saw the end of all commercial trade. However, Reach Lode has never closed and is now used by pleasure craft. Reach Lode leaves the River Cam via its only lock, in the village of Upware close to the aptly named Five Miles From Anywhere pub. A minor road crosses the lode near the lock. The first mile is very straight in a slightly south of easterly direction. At the end of the straight is Pout Hall with a waterways junction alongside. Straight ahead is Burwell Lode which also leads to Wicken Lode (see below) while Reach Lode turns right and continues to the south east, heading dead straight for about 2 more miles into Reach. Apart from the minor road in Upware, the only other road access is in Reach at the head of navigation. To see what Wikipedia has to say about Cambridgeshire Lods, including further information on Reach Lode, click here.